In May 2015, The U.S. Department of Justice announced the agreement to a negotiated consent decree with the City of Cleveland designed to dramatically improve and reform relations between the police departments and the communities they serve. This decree was the result of the 2012 high speed chase and deadly shooting of unarmed driver Timothy Russell and passenger Malissa Williams, and the timing of the findings and negotiations connected the decree to the November 2014 shooting death of 12-year-old Tamir Rice and the death in custody of Tanisha Anderson, who suffered from mental illness. 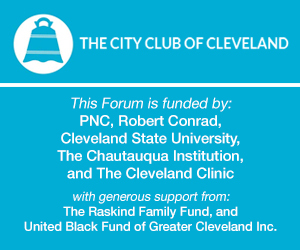 With the recent announcement of the members of the Community Police Commission and the hiring of an independent monitor, we'll convene a conversation about the status of the consent decree, how the community can support the difficult work of repairing police-community relations, and what this means for the future of Cleveland. This conversation will be moderated by WKYC anchor Sara Shookman.